Q: How does a rebreather work? Q: Is a rebreather something for me? Q: Which kind of rebreather is the right choice for me? On your budget and what you want to do with it. Do you want to make dives deeper than 100 mtrs? Are you a photographer (in recreational depths)? Are you a cave or wreck diver? Do you travel a lot? Do you like electronics? SCR's are for recreational use only (Dolphin, Ray, Azimuth, Voyager, Submatix,...). Except the PSCR (passive SCR: RB80, RON, Habanero,...). The SCR is quite cheap, also the training is cheap.They are not very complicate. The theory is easy: it looks a lot like the theory for nitrox diver. eCCCR's (electronic CCR's) have a solenoid which fires oxygen into the loop, when the PO2 drops under a preset setpoint. These type of CCR's can easily go to 140 mtrs and more (Ouroboros, Sentinel, Inspiration, Evolution, Megalodon, Hammerhead, JJ-CCR, etc.). Q: Which kind of Expeditions PTD is organizing? Can I join them? 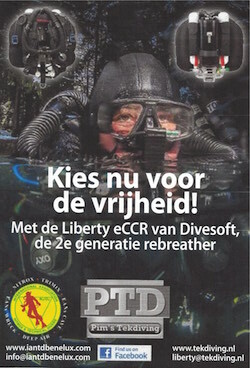 A: PTD organizes expeditionsin cooperation with DIRrebreather. One can participate as a member of DIRrebreather and one has the required certification level for the expedition. Examples of expeditions are in the movies below. Q: From which training agencies I can get thraining at PTD? Q: Which kind of technical courses I can do at PTD? Q: On wich rebreathers can I be trained at PTD? Q: I want to do an introduction on a rebreather. Is that possible with PTD? A: Yes it is. An intro takes 2 hours. One hour of theory and one our in the pool. At least 4 people need to participate. You will dive atleast two different rebreathers. In the movies below, you will get an impression of an intro dive. Q: Where can I get training from PTD? A: Training is available on any location with diving facilities, appropriate to the specific training. When the course is done in The Netherlands, PTD can take care of accomodations and transport from and to the Airport (Schiphol, Amsterdam). Q: What is a Semi Closed Circuit Rebreather? A: A Semi Closed Rebreather uses a pre-mix gas (usually nitrox). The fraction of the gas remains the same during the whole dive. However the partial pressure of O2 will change with the depth (like in Open Circuit). The mix is injected into the loop through a nozzle with a constant flow. This type of SCR we call Active SCR. The gas can also be injected "on demand": on the inhale of the diver. This type of SCR is called Passive SCR. ASCR are 5 times more efficient then OC. PSCR are 8 times more efficient then OC. ASCR: Dolphin, Submatix, Azimuth. PSCR: RB80, RON, Habanero. Q: What is an Oxygen Rebreather? A: An Oxygen rebreather uses only Oxygen as breathing gas. The depth is limited to 6 meters. Oxygen rebreathers are mostly used by the military and by researchers. They are about 60 times more efficient then OC. Q: What is a Manual Closed Circuit Rebreather? A: A mCCR is a CCR where the diver manually maintains a constant Partial Pressure of Oxygen (PPO2). The fraction of oxygen in the inhaled gas changes with the depth of the dive. The PPO2 remains constant troughout the dive. Often mCCR's have a contant flow of Oxygen into the loop of 0.7 liters per minute. In this way it is easier for the diver to maintain a constant PPO2. E.g. : Apocalypse, rEvo, Submatix, KISS, Copis, Apocalypse. Q: What is an Electronic Closed Circuit Rebreather? A: An eCCR is an electronic rebreather. The Partial Pressure of Oxygen is maintained by a computer. The diver tells the computer which PPO2 he wants to maintain. This is called the Set Point (SP). When the PPO2 is below the setpoint, the computer activates a solenoid which alows oxygen to flow into the loop of the rebreather until the SP has been achieved. E.g. PRISM2, Megalodon, Inspiration, Ouroboros and Sentinel.